The painter and sculptor James Washington, Jr. was a leading member of the Northwest School, a group of artists, writers, and sculptors who became internationally prominent in the mid-20th Century. Washington was born and raised in Gloster, Mississippi, one of six children of Baptist minister James Washington and his wife, Lizzie. While Washington was a child, his father fled Mississippi due to threats of violence and the two never met again. Washington’s mother encouraged his talents. He began to draw around the age of 12, becoming an expert pavement chalk-artist, making random marks by other children into figures and faces. In 1938 at the age of 29 he became involved with the Federal Works Progress Administration when he was employed as an assistant art instructor at the Baptist Academy in Vicksburg, Mississippi. Excluded from shows in Mississippi that featured white artists, he organized the first WPA-sponsored exhibition for black artists in the state. In 1941 Washington moved to Little Rock, Arkansas and became a shoe repairman at Camp Robinson. It was in Little Rock that he met Janie Rogella Miller. The couple were married in 1943. The couple moved to the Pacific Northwest in 1944. They arrived in Bremerton, Washington where he worked as a journeyman electrictian on Navy vessels at the Bremerton Naval Base. In 1945 he transferred to Fort Lawton and continued to work as an electrician. He also operated a shoe repair shop. In Seattle Washington became a member of the city’s small art community. He studied painting with Mark Tobey and worked with Leo Kenney. His first major exhibit camed during this period when his work was presented at the Frederick and Nelson Department Store Gallery. From 1948 to 1961 he curated a series of art shows at Seattle’s Mt. Zion Church. During this period he also studied with painter Yvonne Twining Humber and printmaker Glen Alps while taking art classes at the University of Washington. A crucial trip to Mexico in 1951 led to his meeting muralists Diego Rivera and David Alfaro Siqueiros. 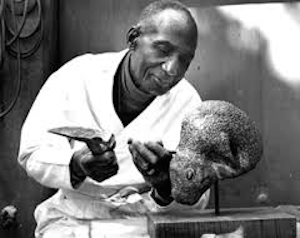 While he was there he was introduced to work in soft volcanic stone which let to his decision to become a sculptor. Upon his return to Settle he began producing sculptures that expressed the unity of God, humankind, and nature. His work was filled with symbols derived from religion, freemasonry, and the animal world. His first sculpture, Young Boy of Athens was carved from a stone he acquired near Teotihuacan, Mexico. Scholars have likened pieces such as Young Boy of Athens and Head of Job to early Mediterranean art in their simplicity and in the power of their expression. James and Janie Washington established a home and studio in a craftsman bungalow in Seattle’s Central District at 1816 26th Avenue. The City of Seattle designated the home as an historic landmark in 1992. The Washingtons willed that after the death of Janie Washington, the home would become a museum and cultural center and that the studio behind the home would be available to future artists through the support of the James and Janie Washington Foundation established in 1997. HistoryLink.org Online Encyclopedia of Washington State History, "Washington, James Jr.: Art as Holy Land" (by Deloris Tarzan Ament), http://www.historylink.org/essays/output.cfm?file_id=5328; Paul Karlstrom, The Spirit in the Stone: The Visionary Art of James W. Washington, Jr. (Seattle: University of Washington Press, 1989). HistoryLink.org Online Encyclopedia of Washington State History, “Washington, James Jr.: Art as Holy Land” (by Deloris Tarzan Ament), http://www.historylink.org/essays/output.cfm?file_id=5328; Paul Karlstrom, The Spirit in the Stone: The Visionary Art of James W. Washington, Jr. (Seattle: University of Washington Press, 1989).